Adding a hood to our shell project is a quick and easy way to add warmth or additional protection from the weather. 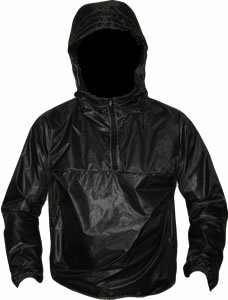 Or make a poncho tarp by integrating a hood made from 1.1 oz sil nylon with a 5 by 8 tarp. You're only limited by your imagination. The shell in the picture was made with 1.1 oz Black DWR Rip stop with yellow thread so that the seams would be visible in photographs. It weighed in at a remarkable 2.5 oz, lighter than every commercial hooded wind shirt available. The pattern is generously sized, so tweak it only if you've got a particularly large melon or long/thick neck. If you don't want a visor, eliminate piece 3 (the visor) and extend the edge pieces 1 and 2 by 1.5" along the edge where piece 3 would have attached. Mark the position of the draw cord exit point on piece 3 using a soap chip or other removable mark, then install the exit point reinforcement of your choice: grommet or button hole. The wind shirt in these directions uses grommets because that's what most people will use, but the shell I carry substitutes a button hole. 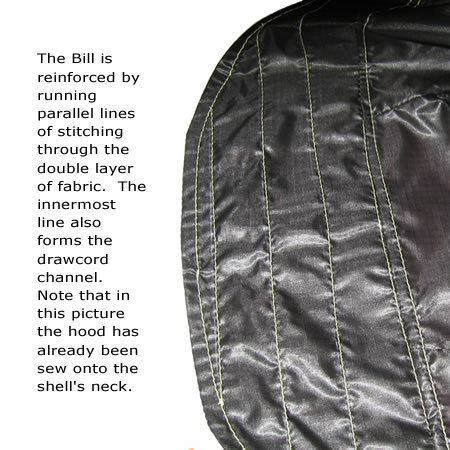 Stiffen the bill by running parallel lines of stitching to secure the two layers of fabric.The draw cord runs in the channel formed by the innermost line of bill stitching and the inner edge of the visor. 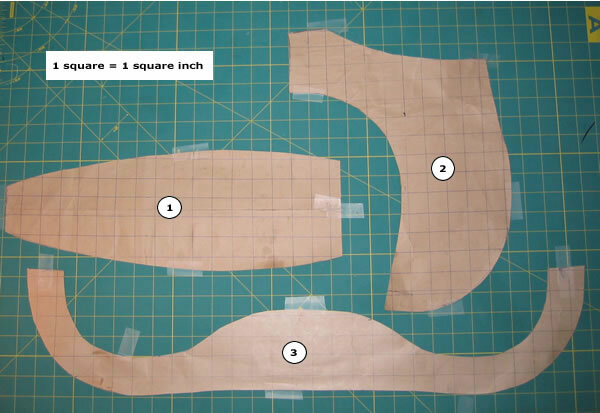 Sew together the body of the hood. The visor edge is longer than the neck edge. 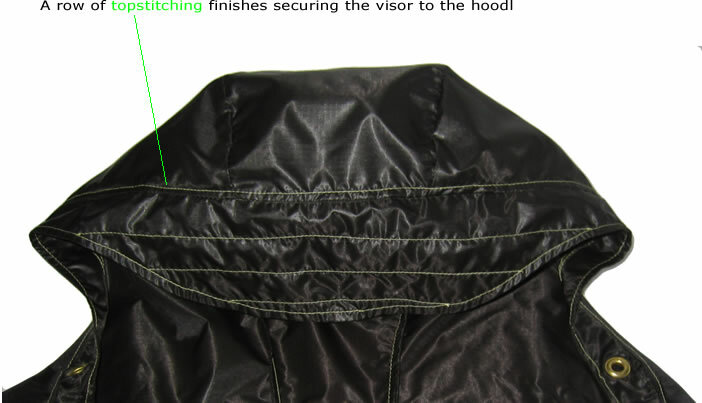 Pin the visor to the hood as shown in the picture, and attach them with a row of stitching. Next turn the hood right-side out and topstitch the inner edge of the visor to the hood. Feed draw cord through its channel, and fit with cord locks. 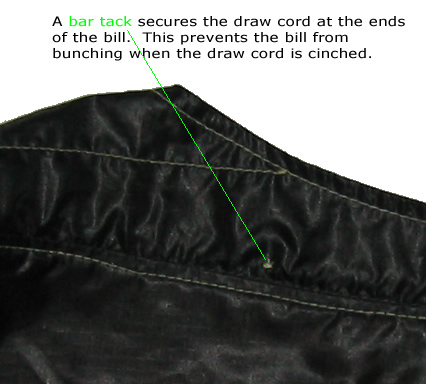 Finally, bar tack the draw cord into its channel at the corners of the bill. 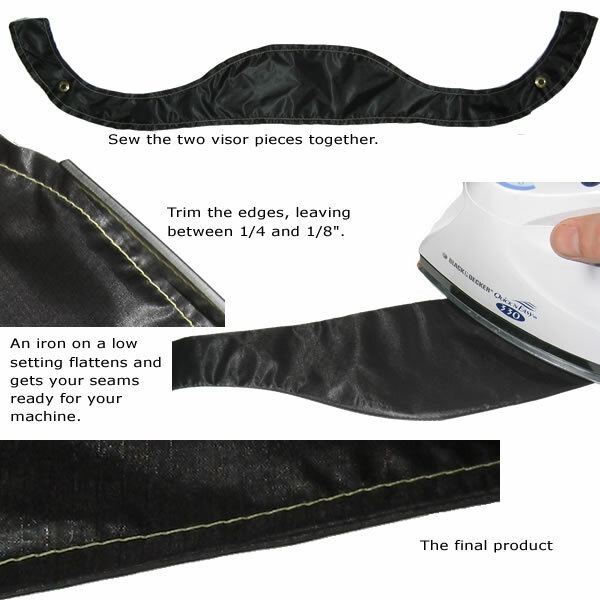 This prevents the visor from bunching when the draw cord is cinched. 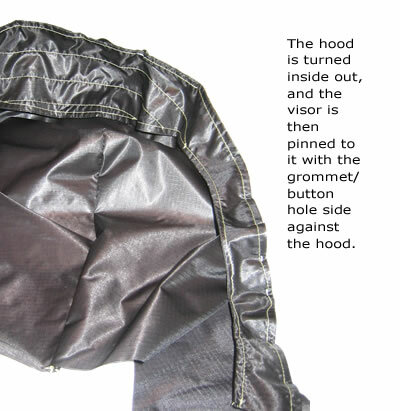 The neck of the hood is larger than the neck of the collar used in the wind shell. Trimming about one inch off the neck should be sufficient to fit the hood. 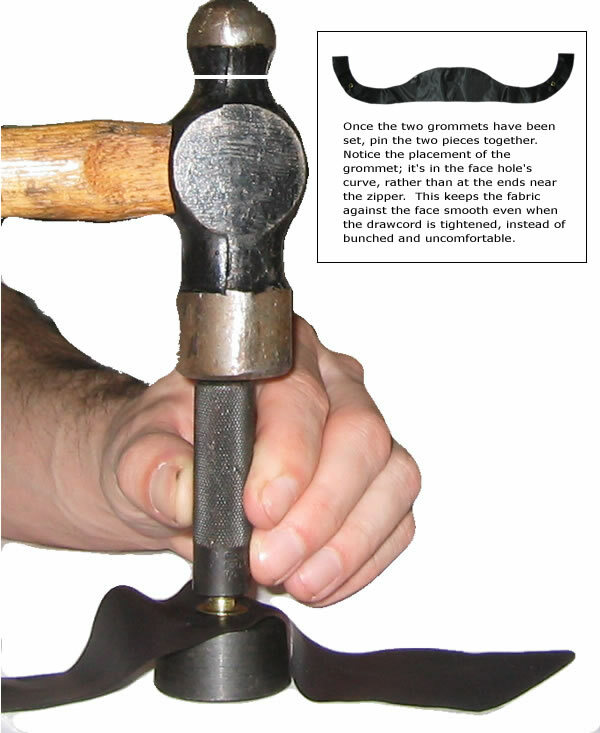 I find that metal grommets tend to pull out of lightweight fabrics.